It speaks to the Orwellian era we are unfortunately living in that the terror-tied Jew-hater Sarsour could frame her supremacist, racist goals in a 60s-style civil rights narrative. There is no more supremacist, racist, misogynist, antisemitic system of governance than the sharia, and no group as dedicated to destroying individual rights, equality for all before the law and above all, the freedom of speech. Blacks are still enslaved under the sharia in Muslim countries. The translation of black person in Arabic is abeed (slave). 20% of the population of Mauritania are blacks enslaved by Muslims. But Sarsour’s Jew-hatred is off the charts, so she projects Islamic racism onto the Jews. 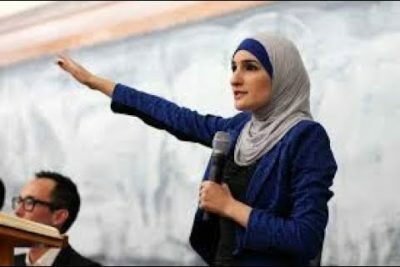 Anti-Israel activist and Woman’s March co-chair Linda Sarsour was excoriated as an “antisemite” on Sunday by a former ally who once headed the DC chapter of the popular political movement. The article promoted by Sarsour was penned by Jodi Jacobson, president and editor in chief of Rewire.News, a progressive website focusing on reproductive rights and other social causes.